The Great Space Race Continues On Mars! Remember the Great Space Race to the moon, that Cold War competition between the United States and the Soviet Union to get there first? Well, decades after the Cold War has long since cooled off, and even longer since the last fiery roar of Apollo and Vostok rockets have been quieted, in the midst of the silence of history we may hear a faint sound: a barely audible whir of electric motors and metal wheels slowly and softly rolling over the dusty ground of a very long and wild race track. NASA's enduring Mars Exploration Rover, Opportunity, which has been traipsing about and exploring Mars' Meridiani Planum for nearly ten years, recently broke a record for distance traveled on the surface of another world. The previous record-holder of this extraterrestrial marathon is the manned Lunar Rover of Apollo 17 driven by Eugene Cernan and Harrison Schmitt over 40 years ago—back when the Cold War and Great Space Race were game on. In December of 1972, they completed a total distance of 22.21 miles across the surface of the Moon. On a day in May this year, Opportunity put in an 88-yard-dash and its odometer clicked over to 22.22. 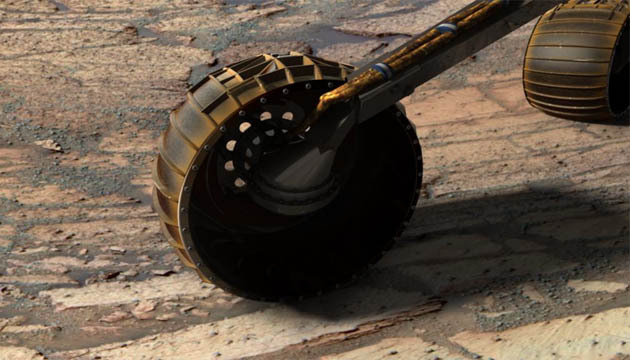 What has taken Opportunity so far across that ancient (probable) sea bed on Mars? The answer is great engineering! Opportunity, and its sister rover Spirit which landed on the other side of the planet, were designed to carry out a mission of exploration on Mars that was to last 90 days. When that nominal mission came to an end, Opportunity entered an extended mission period, which has now stretched on for almost a decade! Though Spirit gave up the ghost in 2010 after six years, the design and engineering of both robots is testament to how good we have become at exploring outer space by remote control. Much of Opportunity's time has been spent crater-hopping and the long miles it has put on is a result of the long-distance crawls between craters. From Eagle Crater--which Opportunity rolled into upon landing--to Endurance Crater, Victoria Crater and now the largest of all, the vast Endeavour Crater, the rover has availed itself the opportunity of examining Martian geologic strata and materials blasted bare by past meteorite impacts. Its studies of holes in the ground, as well as the minerals and rocks along its path, have provided us with strong evidence that Mars had liquid water in the distant past—which of course was the true goal of its mission, not the breaking of distance records. With Opportunity's achievement comes an acknowledgement that it has not yet broken the all-time distance record for travel on an extraterrestrial world. That distinction currently goes to the former Soviet Union's remote controlled Lunokhod 2 rover, which until recently was thought to have traveled a total distance of 23 miles on the Moon's surface back in 1973. This old official figure is currently under debate and reassessment, with new estimates putting it as high as 26 miles. So an echo of the old Space Race can be heard in the grinding whir of Opportunity's wheels as it crawls steadily forward toward that decades-old Soviet all-time record. Can Opportunity do it? If the robot could talk, I imagine it would say, "No problem!" Whether its itinerary of scientific investigation will give it the opportunity to put on the needed miles is another matter.